Explosions intensified on Hawaii’s Kilauea volcano on Tuesday, spewing ash and sparking a red alert for aviation for the first time since the latest eruption began 12 days ago. Ash and volcanic smog, or so-called vog, rose up to 12,000 feet (3,657 meters) above Kilauea’s crater and floated southwest, covering cars on Highway 11 with gray dust and sparking an “unhealthy air” advisory in the community of Pahala, 18 miles (29 km) from the summit. An aviation red alert means a volcanic eruption is under way that could affect aviation by spewing ash into air routes, according to the U.S. Geological Survey (USGS) website. Ash was also a new hazard for residents of Hawaii’s Big Island already dealing with volcanic gas and lava that has destroyed 37 homes and other structures and forced around 2,000 residents to evacuate. “We’re observing more or less continuous emission of ash now with intermittent, more energetic ash bursts or plumes,” said Hawaiian Volcano Observatory (HVO) Deputy Scientist-In-Charge Steve Brantley on a conference call with reporters. Ash is not poisonous but causes irritation to the nose, eyes and airways. It can make roads slippery and if emitted in large quantities could cause electrical power lines to fail, said USGS chemist David Damby. 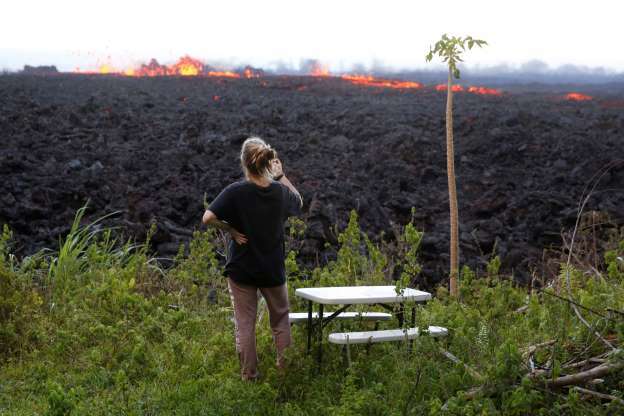 The eruption has taken its toll on the island’s tourism industry. Big Island hotel bookings for summer months are off almost 50 percent from last year, Rob Birch, executive director of the Island of Hawaii Visitor Bureau, told journalists on a conference call. There have been no major injuries or death reported from the eruption. A looming menace remains the possibility of an “explosive eruption” of Kilauea, an event last seen in 1924. Pent-up steam could cause such a blast that would launch a 20,000-foot (6,100-meter) ash plume from the crater and spread debris over 12 miles (19 km), according to the USGS.